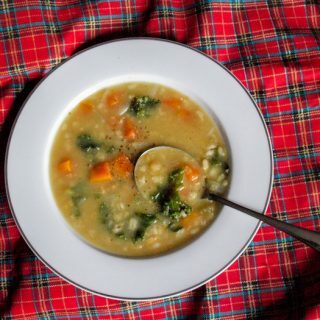 Haggis isn’t only for Burns Night, it makes a tasty and filling meal, particularly in winter. 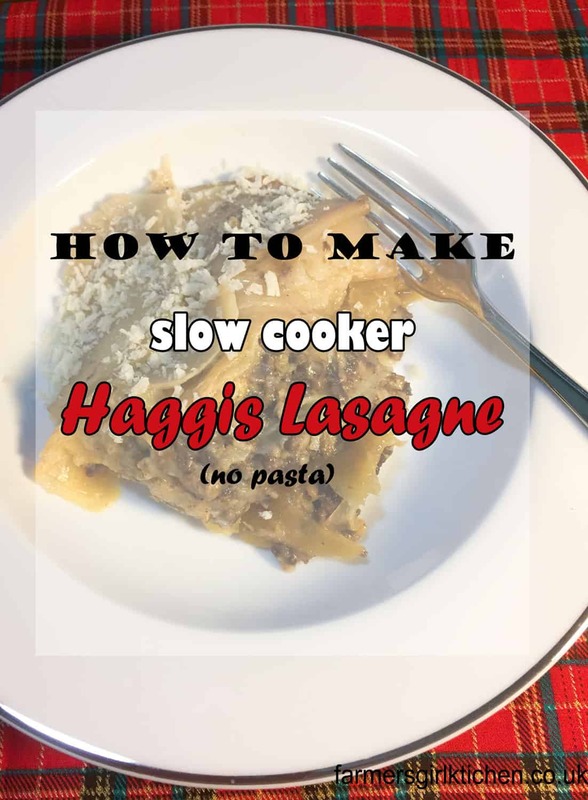 This particular recipe for Slow Cooker Haggis Lasagne came about because my husband won a Burns Night Feast Hamper from Fresh Food Express and it contained a magnificent 900 g haggis. We had already had our Ultimate Burns Supper, so I decided to make something a little different. 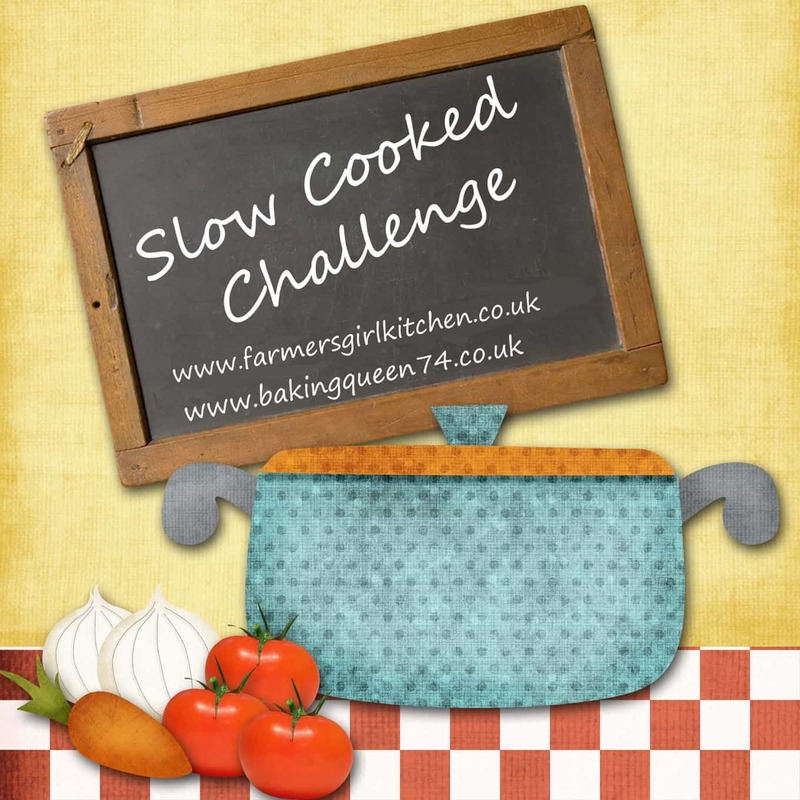 As I’m hosting the Slow Cooked Challenge this month, read more about this at the end of this post and check out recipes on Baking Queen 74 too. I thought it would be fun to develop a recipe using the haggis and traditional accompaniments of ‘neeps (swede) and tatties (potatoes) but in the Slow Cooker. Instead of using pasta, I sliced the swede and potatoes with a mandolin. I sliced the haggis too, taking it out of it’s skin and cutting into thick slices. Just in case you are wondering, that is a Slow Cooker liner I’m using, it’s not essential but saves on washing up! I hummed and hawed about whether to make a sauce for the lasagne, but in the end decided to use cream cheese. The type I used comes in a jar so is a little more liquid than the usual tub, but if you don’t have that, then the more solid type will do, you just need to dot it about and it will melt down when it cooks. The final layer for the Haggis Lasagne is of sliced potatoes which are then topped with a some dots of butter. I happened to have some pink peppercorn butter, but plain butter would be just as good. Do go easy on the seasoning of this dish as the haggis is quite highly seasoned and it could easily become too salty or too peppery if you season heavily. Once the Slow Cooker Haggis Lasagne is ready, sprinkle over some grated cheese, switch off the heat and pop the lid back on for 5-10 minutes and the cheese will melt from the heat of the food. If you are able to pop your slow cooker under the grill, then you could also sprinkle over some panko breadcrumbs along with the cheese to make a nice crisp topping. Layers of haggis, swede and potato make a hearty lasagne-style dish to cook in your slow cooker. Slice the end off the haggis and peel away the casing. Slice 500 g of swede very thinly, using a mandoline or food processor slicing disk. Blanch the swede and potatoes (separately) either by microwaving with a little water for 2-3 minutes or plunging into a pan of boiling water for 2-3 minutes. Place a layer of haggis in the base of the slow cooker. Top with a layer of swede, then another layer of haggis and a layer of potato, season lightly with salt and a little pepper. Dot half the cream cheese over the potato. Add another layer of haggis, a layer of swede, a layer of cream cheese and a layer of potato. Pour over the hot water. Dot with butter, season lightly with salt and pepper. Bake on low for 5-6 hours. When cooked, switch off, remove the lid and sprinkle with the grated cheese, replace the lid and leave for 5-10 minutes until the cheese melts, then serve. If your slow cooker can go under the grill (broiler) then you can grill the cheese along with some breadcrumbs to give a crunchy topping. 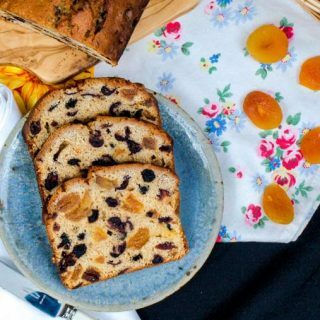 This recipe can also be made in the oven. Bake, covered at 160C for 1 1/2 - 2 hours, remove lid and add cheese and breadcrumbs, then bake for a further 10 -15 minutes. The Slow Cooked Challenge is a monthly Linky dedicated to making recipes using a Slow Cooker/Crockpot or by slow cooking in the oven, aga or other slow method of cooking. 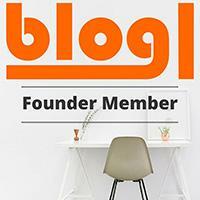 Recipes must be added to the linky by the 28th of each month and a round up will be posted on the host blog. 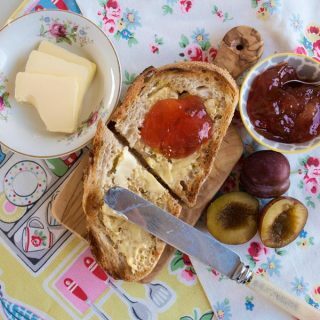 This is without doubt a lovely recipe and I’m sure could be made without the slow cooker BUT the most impressive thing is the liner for the cooker – EASY CLEAN UP…. WOW!!! That made me laugh Mary! I’m no fan of washing up, if you can’t get the branded Slow Cooker Liners, then you can use roasting bags, I’ve done that before. Ooh liking this idea so much. Where do you find those liners btw! 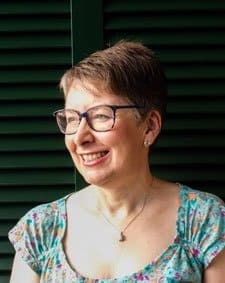 Yum I love the sound of your haggis lasagne Janice, I want my kids to try haggis one day so think I’ll give it a go, they love lasagne, . What a brilliant invention! Thank you, Lucy. I’ve certainly been eating haggis since I was a child, I guess this might be a good way to introduce kids to haggis through a dish they recognise. 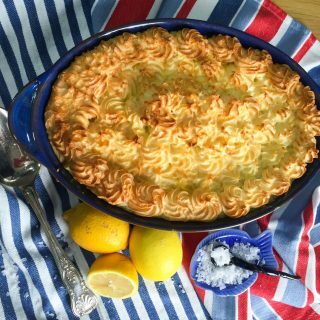 Love this Janice – like a Scottish Version of a Lancashire Hotpot. Never come across slow cooker liners before! Thanks Claire, it was rather good and even reheated nicely. In fact, my husband said it was better the next day! What a great idea Janice! Love the slow cooker liner – I must look out for those. Thanks Sarah, the liners seem to be a popular choice! What a fantastic idea for a slow cooker. Great job with Haggis Lasagne. Gonna try it soon. Thank you. Thanks Michelle, we certainly enjoyed it. I’m sure you will too. What a great idea! I wonder if it will work with vegetarian haggis? Yes, I am sure that it would work just as well with a veggie haggis. Thanks Camilla, a good Ragu is so adaptable. I would never have thought of cooking haggis in a slow cooker! I like the cooker liners! 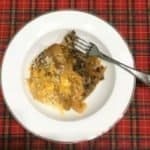 The haggis lasagna sounds delicious Janice! I’ve only had haggis in restaurants and never cooked with it at home but I am quite tempted now. Ok so the Haggis looks good – but THAT SLOW COOKER LINER?!!! Where have they been all my life?!! Ha ha, they’ve been around a while. I don’t bother with them much as I have a non stick Slow Cooker bowl so don’t really need it unless it’s really sticky!